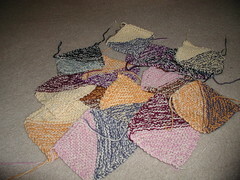 What Happened with the Rug, Part I | Knit Like You Mean It. The thing about the rug was that it was a stash-busting exercise. So you’re supposed to grab all your felt-able wool, find a neutral, knit two-color squares with one strand always the neutral, crochet them together using the neutral yarn, felt the whole darn thing, and ta-da! you have yourself a Felted Patchwork Rug. 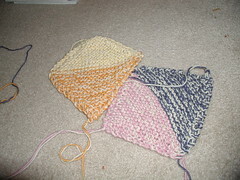 The pattern is from Barbara Albright’s Odd Ball Knitting, a very fine book. 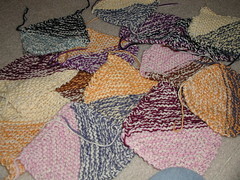 The knitting, however, is by me — and therein, as always, lies the problem. I will say that I don’t necessarily believe that cream is a neutral any more. So the cream-colored yarn seems to have heightened the contrast between the various colors, which is fine, but not helpful. Also, I thought nothing of putting both orange and pink in the same project, and that was a mistake. It persisted in not happening for quite some time. Indeed, it has never happened, and at some point I did have to accept that it would not happen. The rug would not be the thing of beauty of which I dreamed. I clearly had some kind of obscure color-blindness that had to do with combining color; incidentally, this explained my difficulty dressing myself in a reasonable way. Everything made sense, and other than being doomed to a life of knitting ugly items (something to which I had been accustomed for some time anyway) we would all get along just fine. Either that, or I could ask for help.